Fall is beginning to show off around here. What with all the beautiful colors of the leaves before they float gently to the ground. With that in mind and some great recommendations from friends, we decided a trip through California Gold Country was in order. Since we reside in the Reno area, it makes the most sense to begin our journey visiting California Gold Country on Highway 49 at its northern most point. The addition of the fantastic fall foliage just was that extra bonus to make the trip even more memorable. To get to its northern most point we took Hwy 395 north out of Reno to Hallelujah Junction (Hwy 70) and headed west the few miles to Vinton and Hwy 49. Don’t blink, you may miss the turnoff. We headed along this scenic highway and learned a bit about the area as well. 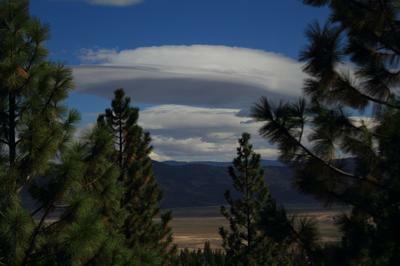 Did you know that the Sierra Valley is the largest Alpine Valley in the US? As you head up the road you will find a Vista point turnout and you can see just how large this valley truly is. We stopped along the way to take photos of course and the evening light was great for shooting a few frames. But our mission on our first night was to get to a campground that was recommended by friends. There are quite a few along Highway 49 to choose from. Full Timers keep in mind that this highway is very winding and at some points has speeds as low as 15 mph at one hairpin. So larger rigs proceed at your own risk. You can stay in the Sierraville/Loyalton area and drive your towed vehicle to some of these spots for a great day trip. There is also a small RV Park not far from Vinton. This is also an easy outing from the Bordertown RV Park on the Nevada California border if you’d like to park. Leave early in the morning so you can take your time exploring before it gets to be dusk. It does get dark a bit early this time of year. We rushed a bit to get to our first campsite at Chapman Creek – as we don’t really like to set up in the dark if we don’t have to. Alas, because of stopping for the beautiful sunset we arrived a bit later than we had hoped. But that is where this Slide In Camper shines. She is easy to level and get things adjusted and since we have such a compact space, we really don’t have a lot of items to unload for the campsite. So we set up for the night, made dinner and had a fire to keep us warm. The nights this time of year at this altitude do get crisp. But after an adult beverage and some campfire talk we settled in for the night. We set the thermostat on the camper and snuggled into bed. It was below 40 degrees that night, but our camper kept us warm and cozy. Our space is easy to keep comfortable and we even needed to open a window or two in the morning while I made breakfast on the stove – that is how well insulated this camper is – not an indication of how bad my cooking can be! 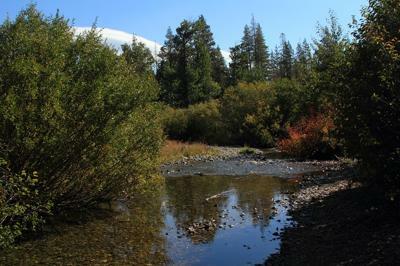 Chapman Creek is a USFS campground that has water, several primitive toilets and the campsites have both a fire ring or pit and a camping stove along with a picnic table. The campground was clean and it appeared that many of the tables had recently been painted. This small campground is quite popular as there is a trailhead located here for hikers. The camp was not crowded - did I mention it was a little chilly – but there were four other sites in use while we were there. We met up with the folks that manage this site along with several others in the area and even bought some firewood. They do a great job of maintaining the campgrounds. We toured a few others during the day on our way back from Downieville. So after breakfast we packed up our stuff and headed down the road making notes of places we wanted to stop on our way back to find a campsite for the evening. My goal was to get a far as Downieville and then backtrack and camp for the night somewhere along 49. Well we did get a part of the way before we stopped at Bassetts. Great little store with all kinds of stuff. We got an ice cream cone - the black cherry was fantastic and then continued down the road. The route here is very winding and the trees are just beginning to turn. A week or two and they will be a sight to see for sure. You cross a single lane bridge into Downieville and at the stop sign turn to your left and head down to the parking area. The town is easily walked and is very scenic. There is a local company that takes folks with mountain bikes up the road past Bassetts and the trail leads down into Downieville. The people riding through town looked like they had a good ride. Ladybugs, yep LADYBUGS! More than I think I have seen in my lifetime were everywhere in Downieville. We shot several photos and had a plate of nachos and a beer at a small eatery along the main street. After a few hours we headed back the direction we had started from. 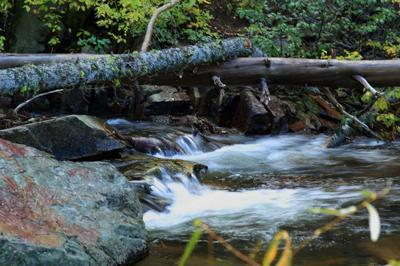 We stopped at many locations along the way to check out campsites and take additional photos. There are spots that have signage on the trees that these are active gold claims and that there is no camping. 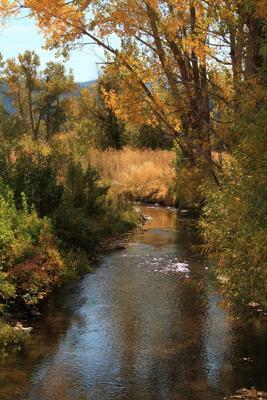 Along our route back we stopped at the Union Flat Campground which is nestled right along the river. Loganville was also very nice. On this route you cross over the Pacific Crest Trail. I for one don’t think I will ever be in any shape to do this route – but it’s out there for hiking enthusiasts. On our way to camp for the night we took Gold Lake Road to the vista of the Buttes and continued onto Diablo Camping area. This is very primitive with only one small outhouse – I really don’t think I would go to this site again. It was fine for one evening, but it would not be my first choice. We did have a great evening and got back on the road in the morning, stopping at points along the way for various views and the like. On our way back to Reno we went through the Yuba Pass campground – looks like a great place to consider a night or two for sure. This trip was a great weekender – just far enough to know you have left home – but close enough that the drive wasn’t too much. Where is the next stop? We are still discussing our options…… until then, stay safe. Sounds like you're having a great time traveling around with your new camper. Isn't autumn beautiful? I sure enjoy it at home or away. Great article...keep it going! Excellent article Laurie. Your well-written description of the area certainly brought the highway section in the California Gold Country alive for us who have never been there. Will have to add it to our bucket list of areas we want to visit. Sounds like a great trip! We will have to look into going someday soon. I always love reading about your adventures. Your well written stories combined with you beautiful pictures are a real treat. Perhaps you should consider visiting the Royal Peacock Mine in Northern Nevada. I have never been but I really want to go. Love your pictures and articles, keep 'em coming!